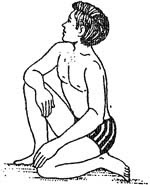 Sit erect on the ground bending the knees. Keep the palms on the knees. Lower the left knee to the ground, bend the trunk to the right side as much as possible and look back to the right side. Then come to the original posited Repeat this asana on the other side. Repeat this asana eight times on both the sides.